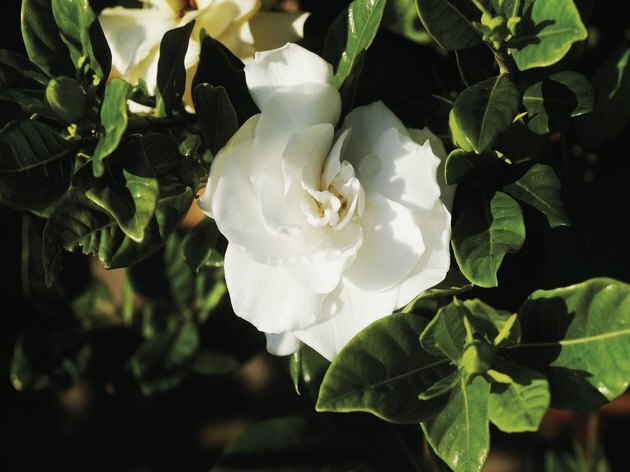 The fragrance wafting from a flowering gardenia shrub is like no other. In the warm south, it fills the air in spring and early summer. They thrive in humid climates and are native to China and Japan. Recreating this environment is a little tricky indoors, but with some light, luck and love, you can enjoy a microcosm of this outdoor wonder. Purchase a healthy, flowering specimen at the local plant nursery, big-box outlet or florist. Choose a small leaf variety that is appropriate for indoor applications. Read the plant tag for approximate height or ask for assistance from the plant professional. Look for disease-free leaves and plenty of flower buds. These slow growing miniatures make handsome bonsai if you are a meticulous caregiver. Provide a brightly lit location out of direct sunlight, cold or hot drafts. A south facing window is preferred. Keep the humidity levels high by sitting the pot in a tray filled with gravel, small rocks or fish tank glass so water will trickle through and accumulate below the pot. Never let the base of the pot settle into the puddle. This creates root rot. Mist the leaves only, avoiding the buds or flowers, during hot spells. High humidity also works to prevent red spiders from infiltrating. Keep the soil moist, not soggy, particularly when it blooms. Take care to water the soil only. This keeps the flower buds forming and prevents fall off. Maintain a temperature of 60 to 65 degrees to set flower buds. This emulates the cooler night air outdoors. Great or sudden changes in temperature will make flower buds fall before blooming. Fertilize lightly every three weeks during flowering. Any commercial food specially formulated for acid-loving plants, such as rhododendron and azaleas, is best. Resist at other times for the plant is in dormancy. About once each month, place the pot in the sink and flush it gently with water until it drains through. This eliminates fertilizer build-up. Repot the gardenia using a prepared acidic potting soil. Plastic pots are a good choice because they retain water longer than Terra cotta pots. Propagate new plants in early spring. Take several cuttings, remove the lower leaves, dip them in rooting hormone powder and insert them into a loose mix of peat and vermiculite. Keep the mix moist, but not soggy. Roots should form in four to six weeks.